Group Fitness Classes are included in the price of our memberships! We offer a wide variety of classes from cardio or strength based fitness classes to fun dance classes that will get your body moving and elevate your heart rate! Get into Pilates, Yoga, Kickboxing, Zumba, Cycling and much more with instructors who are experienced, friendly, and dedicated to your success! Why not sign up for a gym membership with us today and get in the best shape of your life! Get that beach body at Island Health & Fitness where we make fitness fun! Contact us now for a membership! FitCamp is our 3 day a week bootcamp. You want motivation and serious results? Commit to FitCamp! Our bootcamp is taught by a certified personal trainer who will take you through a rigorous workout including strength and cardio conditioning. You’ll never get bored as the routine is never the same to keep your body guessing and burning calories! Take your fitness to the next level and get the guidance and direction from a highly qualified instructor! Our traditional small group classes. Working with a trainer doesn’t have to be a solo affair. We also offer small group training programs that focus on specific types of training that can be optimized in a group setting, like strength training workshops, specialized TRX programs, advanced level bootcamps, Kettlebell Camps and more. As with our one on one sessions, trainers need to obtain advanced certification to specialize in delivering these modality specific group workouts. Get ready to sweat and see incredible results in the exclusive private personal training studio room and outdoor area! There are some very good reasons why SGT is becoming so popular. Check out our list for why our SGT is so hot! 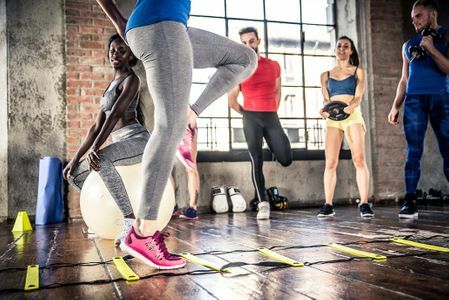 Variety – By working with a knowledgeable fitness professional, your workouts will change/evolve as you progress, preventing hitting a plateau and getting bored. Camaraderie – Those that train together, stay together! Sharing the workout enhances the experience for all the participants. More affordable – While private training provides our members with the most personal attention, you may find that SGT fits into your budget better and still gives you the attention you need. Motivation – What’s wrong with a little healthy competition? Working out alongside others will definitely push you to your limits and ensure that you get the max out of every workout. Fun – Yes, fun. When exercising with others, the energy of the group will keep you having fun each step of the way! 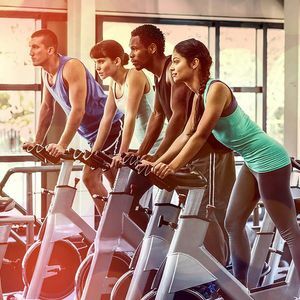 Results – Bottom line, when you stick with a knowledgeable trainer and train with others, you are more likely to stick with it and therefore see great results! Working in a group can really help push your results to a new level. Whether you have a group of your own that would like a specific time slot or you would like to join one, we can make it happen! Personal training is the fastest and safest way to reach your goals at the gym. And we've got only the best certified personal trainers to choose from - specialists in all different areas of fitness who can work with any type of injuries.